The second Making Common Ground session welcomed a few new faces to the group. We continued stitching, introducing some new textiles reference points. 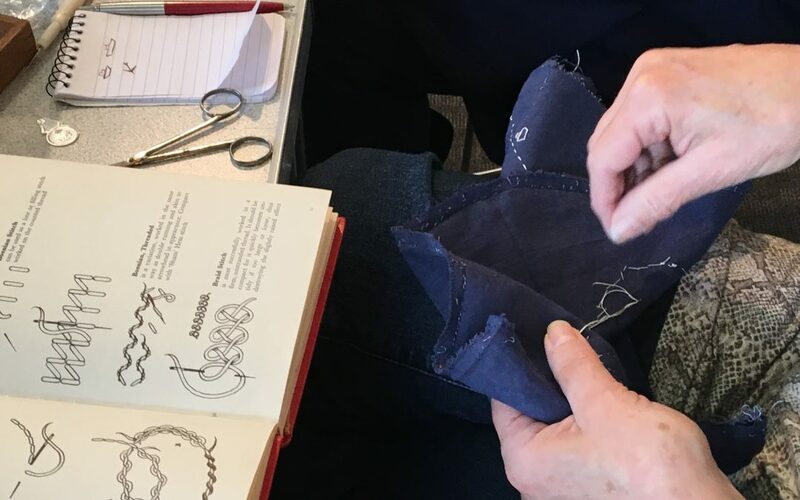 One person had dug out a lovely book of stitch techniques to bring along. The conversation again was really inspiring. We shared artists whose work we admired, making techniques to work through the creative block and of course more stories of family, personal narratives and place. The work and the talk explored landscapes as diverse as Peru, Venice, the New Forest, St Agnes and a Dutch 17th C ship wreck, China, Calshot, London, Norway and a non identified landscape where the journey keeps coming back on itself. It is going to be interesting to piece these ‘maps’ together. The places they represent are so diverse and every stitch is deep with meaning. I can’t wait to see what this Friday brings.